The first story hurt. The second one broke us to pieces as time gracefully stayed a moment so we could catch our breath as we regained our balance on jellied legs. Yesterday, we visited 3 of the 16 schools in need of having classrooms or buildings rebuilt after the 2015 earthquakes destroyed portions of the school or rendered a section unusable. The three schools we visited take in poverty-stricken students at no cost to the student’s parent or guardians. 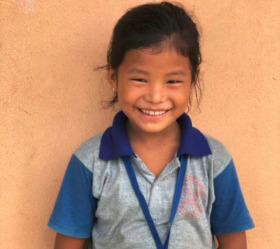 While visiting one of the schools, a cluster of stories emerged that paint a harsh image of the problems that children living below the poverty line have to overcome in rural Nepal. The Shree Janakalyan Secondary School in Shuklagandaki is located a stone’s throw from the Prithvi Highway. There are over 300 students at this school. A majority of the students come from low-income homes. After meeting with the school’s administrators for a few minutes, we asked if we could talk to the students. They took us to meet about 20 children, ages 7 to 15, in one of the school’s bigger classrooms. We greeted each other with a gracious and respectful Namaste. We went around the room introducing each other. They spoke English to us as they told us their names and where they lived. One boy, Sangam Shahi, sang a beautiful rendition of Ed Sheeran’s Perfect. But it didn’t take long before we realized that the beautiful smiling children in front of us have stumbled through many hardships. The first story completely blindsided us. Maybe it was because 9-year-old Suren stood up with such a calm, respectful nature. He spoke quietly in a T-shirt with a big blue collar that his neck couldn’t fill, making his already pint-sized frame seem a bit more diminutive. 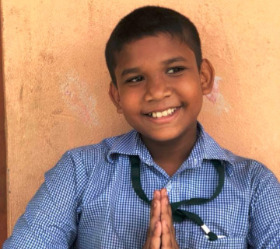 Dirt-stained fingers came together in a Namaste pose below a gorgeous dimpled smile that juxtaposed his story. Six years ago, he survived. The story begins with him sitting on his mother’s lap next to an open window on a crowded bus as they drove through the Nepali countryside. That doesn’t seem unusual because buses in Nepal are filled until every available breathing space contains a body that is twisted, bent, and uncomfortably pressed against another. The overload nearly overwhelms the bus’s shocks as the bus driver maneuvers sharp corners while a part of the bus’s frame grinds on an axle. We don’t know if Suren was in a bus that reached its limits, but we do know that something went terribly wrong and the bus crept too close to the edge and started to tilt over a cliff. Before the first flip, Suren’s mother threw him out the open window. He landed safely on the jungle floor next to the road. She died on impact. 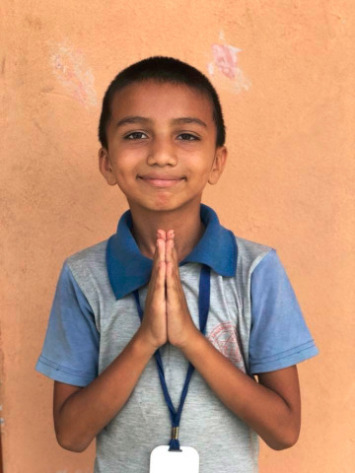 Suren now lives with his Uncle and has dreams of becoming a rocket scientist. My heart never missed so many beats as we all nearly crumbled. I had to turn away for a few seconds to get my emotions under control. Out of respect, we didn’t ask about the details of her story. We are just glad she is even in school, standing tall with her classmates and dreaming of the day she can become a nurse. As we continued around the room, we learned that these students’ parents or guardians are not educated and are scraping by working as garbage collectors, brick factory workers, construction workers, and haulers. A lot of the students come from broken families and a few have never seen their father. One girl wants to become a doctor after seeing her grandfather die early because he didn’t receive proper medical care. Another wants to be a social worker to help children that don’t have a family. Across the room, there were children who wanted to be teachers, nurses, and one girl has dreams of becoming Nepal’s prime minister. Her platform? Adjust the school system so deprived children have an equal opportunity to education. Poverty and deprivation affects every aspect of life for those living in rural Nepal, especially education. We believe education and educational resources, more than anything else, will bring lasting change more quickly and more effectively to children throughout Nepal. By helping this school rebuild two classrooms that collapsed, they will be able take in 200 more students and turn those students into powerful dreamers as well. While their stories are like a vast pillow of grey clouds gathering overhead, these children are dreaming with eyes wide open to the heavens and they have solutions that can strengthen their nation. Solutions born out of pain from their lived experience.